Want to live in the amazing old neighborhood of East Sacwithout any of the maintenance and concerns that comes with owning a 70 year old property? Looking to live on a charming street with a canopy of trees but still have a true master suite with two walk-in closets and a spacious master bath? 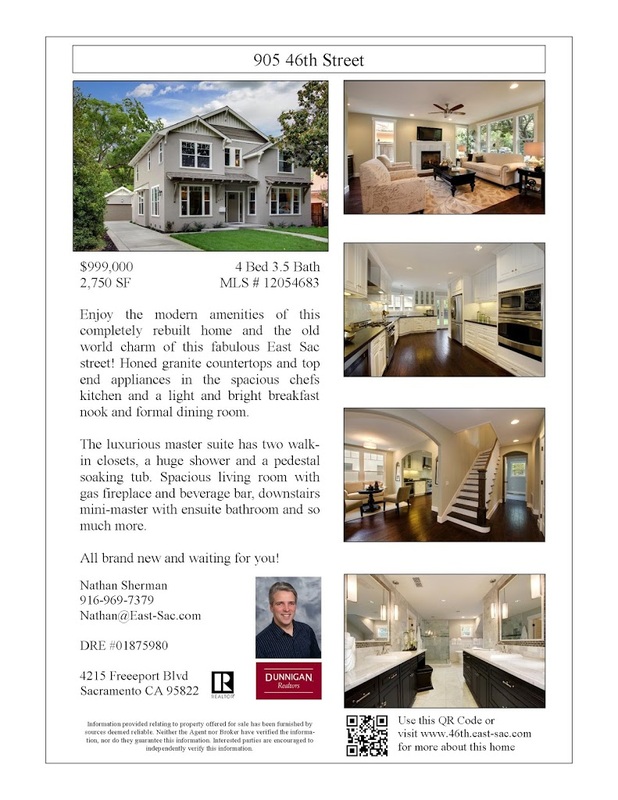 “Enjoy the modern amenities of this completely rebuilt home and the old world charm of this fabulous East Sac street! Honed granite countertops and top end appliances in the spacious chefs kitchen and a light and bright breakfast nook and formal dining room. The luxurious master suite has two walk-in closets, a huge shower and a pedestal soaking tub. Spacious living room with gas fireplace and beverage bar, downstairs mini-master with ensuite bathroom and so much more. Where the sign rider takes an interested buyer. The listing on my own website, www.east-sac.com. The listing on Realtor .com. The listing on the local MLS client page. The listing on Trulia .com. The listing on Redfin .com. There are more places going up soon, but these are the first to populate. The “Just Listed” postcards are going out in the next day or two to over 100 neighbors. I love this process, especially when I have such a great house to list!